Montreal is the Cuisine Headquarters of Canada. with it's festivals and variety of food as well as it's fun loving way of life. Blessed with one of the most exciting food scenes in North America, the city of Montreal in the French Canadian province of Quebec brims with temples dedicated to Kamouraska lamb, Arctic char and poutine (fries smothered in cheese curds and gravy). You'll find irresistible patisseries, English pubs, 80-year-old Jewish delis and magnificent food markets that are reminiscent of Paris. There are hipster bars with bowling alleys and innumerable cafes in which to while away a lazy afternoon. ...And, above all, there are the best bagels on the planet. Toronto may be Canada's economic capital but Montreal remains the country's cultural juggernaut, with about 250 theatre and dance companies, more than 90 festivals and a fascinating medley of neighbourhoods where artists, writers and musicians have helped cement the city's reputation as a great arts centre. The Festival International de Jazz de Montreal is the headline event, followed by parties dedicated to world cinema, comedy and gay pride. Montreal is a slice of old Europe in a pie of contemporary design. 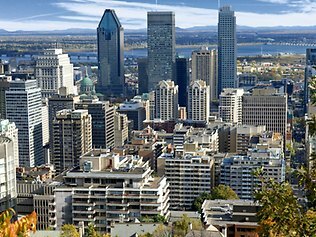 A day's wander might take in the photogenic 18th-century facades of Old Montreal before a cycling tour of the Canal de Lachine, or take in the shops and restaurants of downtown and end up at the inviting terraced cafes of Le Plateau-Mont-Royal. The city has a wealth of heritage churches, such as the breathtaking Basilique Notre-Dame, as well as 20th-century icons such as the Stade Olympique and Habitat 67. Montreal gets long, cold winters. But its natives have learnt to make the best of them, cheering on local hockey legends Les Canadiens de Montreal, tobogganing in Parc du Mont-Royal, building ice hotels by the St Lawrence River and skiing at many fine resorts nearby. Or wander through the underground city and surface at the nearest pub. The old city is where Montreal began and where its heart lies still. Stroll its cobblestone streets and grand plazas. Learn about its history in its museums. The neighbourhood also has fine churches, 19th-century (and earlier) buildings alongside contemporary constructions, excellent shops and boutiques, numerous art galleries and bohemian cafes, as well as some of the finest dining and accommodation in Montreal. This recently expanded gem in the heart of Montreal is one of the best museums in the country. And entry to its permanent collection spanning everything from Old Masters to contemporary artists is free. The new Bourgie Pavilion is in a gorgeous, 19th-century church adjacent to the original neoclassical building, while the modern Desmarais Pavilion across the street reflects its engagement with contemporary art. Montrealers are justly proud of their passion for cultivating and appreciating good music. What else would you expect from a city that has turned out everything from Leonard Cohen to Arcade Fire? That's partly why thousands gather downtown every summer for the sizzling sounds of the Festival International de Jazz de Montreal. Free outdoor shows, star performers and a wide variety of genres make it one of the best reasons to visit. The pride of Montreal and one of the most beautiful churches on the continent the Basilique Notre-Dame is a 19th-century Gothic Revival masterpiece that was built with spectacular craftsmanship. Originally a humble building dating from 1683, it was rebuilt in 1829. Everything from its great, 11-tonne bell in the western tower to its 1891 organ with 7000 pipes, and its stained-glass windows depicting the city's history speaks of the strong faith of the congregations of yesteryear. The Parc du Mont-Royal is the large green space covering much of Mont-Royal, the mountain at the heart of the city. Montrealers grow up sledding down and skiing its slopes and skiing on its ponds in winter, while the rest of the year presents perfect opportunities for looking out over the city from its belvederes, or for jogging, biking or simply walking its many forested paths. An abundance of fauna and flora make it a nature-lover's paradise. This massive redevelopment is transforming downtown Montreal into an even greater centre for festivals. When complete, the Quartier des Spectacles will take up about 1sq km of the city and have 28,000 seats in 30 performance halls and more than 80 cultural venues. The city's centrepiece museum has expanded into a neighbouring 1894 church, where 600 Canadian artworks are on display. The Claire and Marc Bourgie Pavilion also features a beautiful new concert hall. This is an edited extract from Lonely Planet Montreal & Quebec City (3rd edition) by Timothy N. Hornyak and Gregor Clark. Published this month, RRP: $32.99.